From box CP/CENT/COMM/06. FILE 05: Minutes and notes of BRS redrafting group established in 1988, taken by Margaret Woddis; correspondence from group members and others, 1988. -- FILE 06: Papers and submissions from group members, 1988. -- From box CP/CENT/COMM/07. FILE 01: Papers and submissions from non-members of the group, 1988. -- FILE 02: Reports, letters, submissions to the CPGB and its EC in connection with the "Facing Up to the Future" debate, 1988-1989. -- FILE 03: File assembled by Nigel Kelsey of Brixton branch CPGB on the "Facing Up to the Future" debate, including discussion contributions in "News and Views", NK's letters to the EC, the drafting group and other individuals, with some replies, 1988. CP/CENT/COMM/06/05: Minutes and notes of BRS redrafting group established in 1988, taken by Margaret Woddis; correspondence from group members and others, 1988. CP/CENT/COMM/06/06: Papers and submissions from group members, 1988. CP/CENT/COMM/07/01: Papers and submissions from non-members of the group, 1988. CP/CENT/COMM/07/02: Reports, letters, submissions to the CPGB and its EC in connection with the "Facing Up to the Future" debate, 1988-1989. 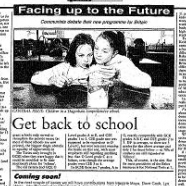 CP/CENT/COMM/07/03: File assembled by Nigel Kelsey of Brixton branch CPGB on the "Facing Up to the Future" debate, including discussion contributions in "News and Views", NK's letters to the EC, the drafting group and other individuals, with some replies, 1988.